Veronica Wells draws her influences from popular culture, examining images that portray an idealised way of life. Fashion, material possessions, image, style and relationships are all explored enticing the viewer into her world. Mixing rough and broad brushstrokes with finer, more intricate details, Veronica Wells paintings questions ideas of perfection. The women she portrays are often distorted in their proportions, with faces and limbs exaggerated. Their clothing and posture is important to the image, a costume that's part of a scene played out for us. Their actions are part of the play, some characters are strong and forthright while others are louche or even vulnerable. The sparkling or patterned details of their clothes are picked out in the lively brush-marks, adding to the drama of the work. Veronica enjoys allowing the paint a reign of its own, with drips flowing and their colours pooling and mingling. 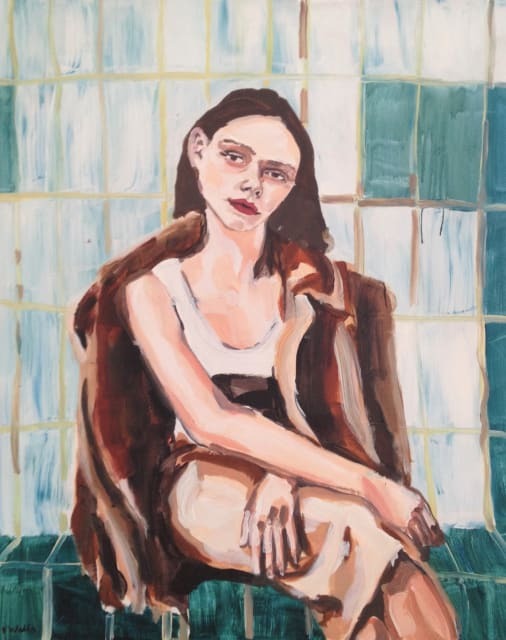 'The effect of the paint lends an unrefined touch to the glamour portrayed and gives a feel of the momentary, like a Polaroid hung up to view a passing snapshot in time, ' she explains. Veronica Wells is a graduate of the Winchester College of Art (2009) and continues to exhibit her work nationally. She has exhibited her paintings with Sarah Wiseman Gallery since 2012, to critical acclaim. Sarah Wiseman Gallery recently arranged a private commission by Veronica for internationally renowned dress designer Jenny Packham, inspired by one of her recent dress collections.